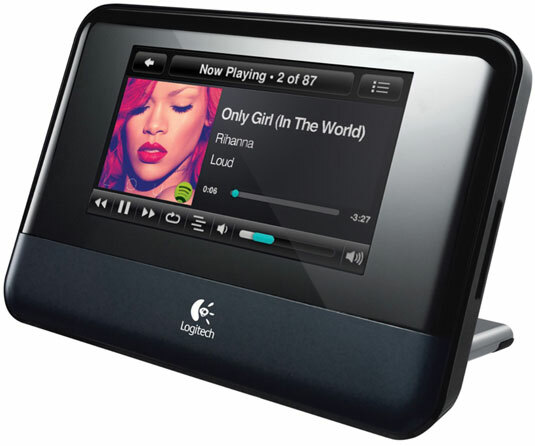 The Logitech Squeezebox Touch music player is a versatile little thing and one of Spotify’s hi-fi partners. You can wirelessly stream your computer’s music to it from wherever you are in the house. You download special software called Squeezebox Server to run on the computer that stores all your music, and that software streams wirelessly to the Squeezebox device. The Squeezebox Touch can also detect music stored on a range of other computers in the house, including high-capacity NAS (network attached storage). The Squeezebox can stream online music and radio stations without the need for your computer to be on, which is where Spotify fits in. Spotify now officially works with the Squeezebox Touch and the Squeezebox Radio (which streams only online radio stations), and lets people listen to tracks from their Spotify library in CD-quality, 320-Kbps sound (where available). All you need to do is log into the Squeezebox’s app gallery by using your Squeezebox account, add the Spotify app, and then log in with your Spotify Premium credentials. The Squeezebox Touch retails for around $250 (£200 or €250), and the Squeezebox Radio can be found online for around $145 (£160 or €140) — prices do vary, so it’s worth hunting around for special deals. The Squeezebox itself is compatible with NAS (network attached storage) drives as long as the NAS is running the Squeezebox Server software. But when it comes to streaming local files on an NAS through Spotify, it takes a little extra technical know-how, and compatibility is patchy (it works only on NAS drives that don’t run Intel processors, for example). Nor does the official Spotify app work on older Squeezebox models, such as the Duet or Boom. These limitations haven’t deterred the determined music-loving geeks, however! There are unofficial plug-ins that can get the Squeezebox working in certain scenarios. These plug-ins are not supported by Logitech or Spotify, so tinker around only if you’re confident! Search the Logitech Squeezebox forum and Spotify forum for discussion of these plug-ins.